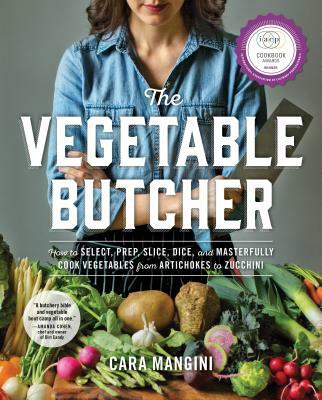 Back in January, our marvelous Workman Publishing sales representative asked if I'd be willing to participate in recipe testing for a forthcoming cookbook called The Vegetable Butcher: How to Select, Prep, Slice Dice, and Masterfully Cook Vegetables from Artichokes to Zucchini. 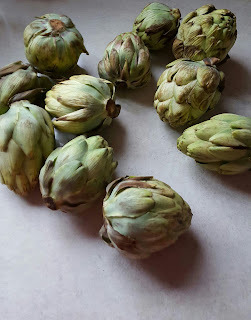 When he said I'd receive some recipes and a box of artichokes, of course I agreed. Fast forward to the end of March. I'm moving in 10 days, and my kitchen, usually replete with specialty gadgets, machines, spices, etc, is mostly packed up. Only the bare necessities – knives, cutting boards, a few pots and pans, salt and pepper – remain. And now, the long-ago promised box containing two pounds of baby artichokes appears on my desk. I immediately went through a mental list of friends who might let me invade their kitchens for a evening, but I was getting ahead of myself; I should at least look at the recipes before panicking. Fortunately, the two baby artichoke recipes included in the excerpt appeared achievable in my minimized kitchen state. I chose to make the Baby Artichoke Torta, an egg-based baked dish with Parmesan, breadcrumbs, garlic, and onions. I hadn't prepared an artichoke in over 15 years (can you tell they're not my favorite? ), so I followed the instructions for butchery and read the notes carefully. Too bad I wasn't so careful about reading the ingredients list before I started. I had to make a last-minute run to the grocery (thankfully across the street) for not one or two but FIVE ingredients. I think that's a personal record. Hey, I'm moving. I blame the stress. I boiled the trimmed artichokes, then sauteed them with diced onion and minced garlic. Once the artichokes started to soften, I added a few spices and some freshly chopped parsley. Then I whisked 7 eggs and slowly added in the hot vegetable mixture. I added some breadcrumbs and Parmesan, tossed it all in an 8 x 8 baking pan (a glamorous disposable foil one that I'd found the week before in the recesses of a cabinet above the fridge), and baked it for 35 minutes. As soon as it was in the oven, I bolted out the door to the bookstore to pick up the salvaged packing material I'd stashed earlier in the day, and I walked back in the door just as the timer sounded. Perfect! My apartment smelled of toasted breadcrumbs and parmesan with a veggie undertone. 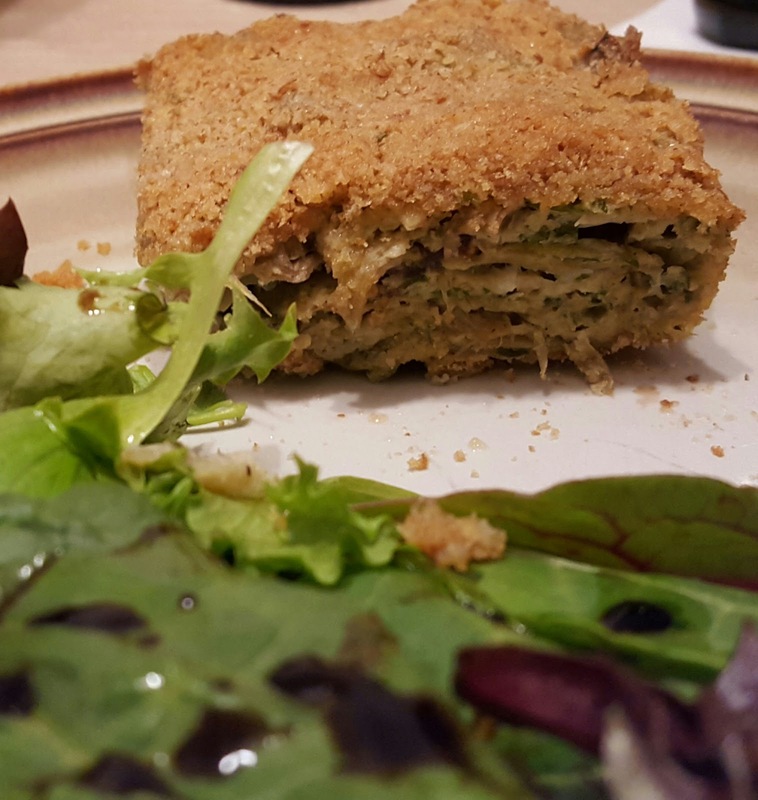 I relaxed on the couch for ten minutes while dinner cooled, then cut squares of the torta and served it with a mixed green salad drizzled with olive oil and balsamic vinegar. The crumb topping was crispy, the filling flavorful, and the texture just right. Next time someone presents me with a pile of artichokes, I know just what I'll do.